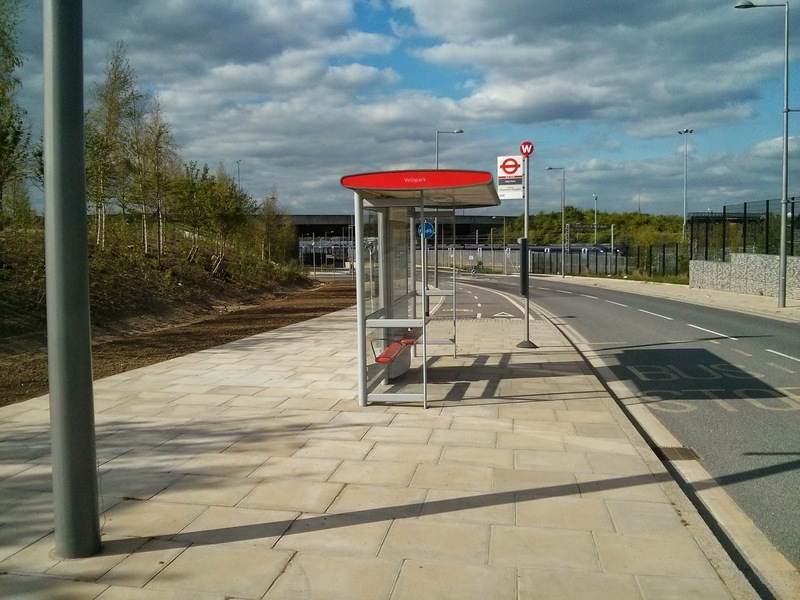 When I started this blog last summer I had every intention of updating it regularly. I was more surprised than anyone else when on returning to work after a short holiday, I found myself promoted. With the new position came some long days and plenty of work. Now things have settled down I should be able to find the time to update this blog again. Maybe. 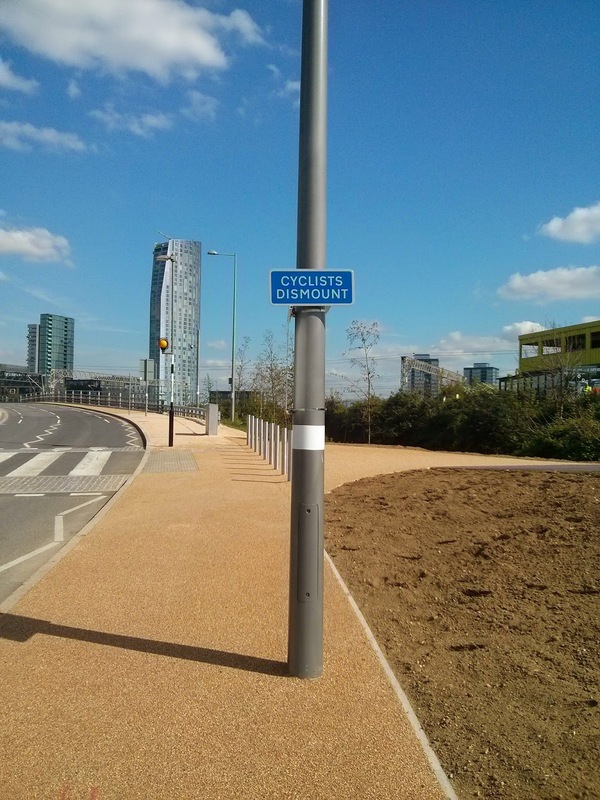 My first post was written immediately after the North-Western section of the Olympic Park reopened. 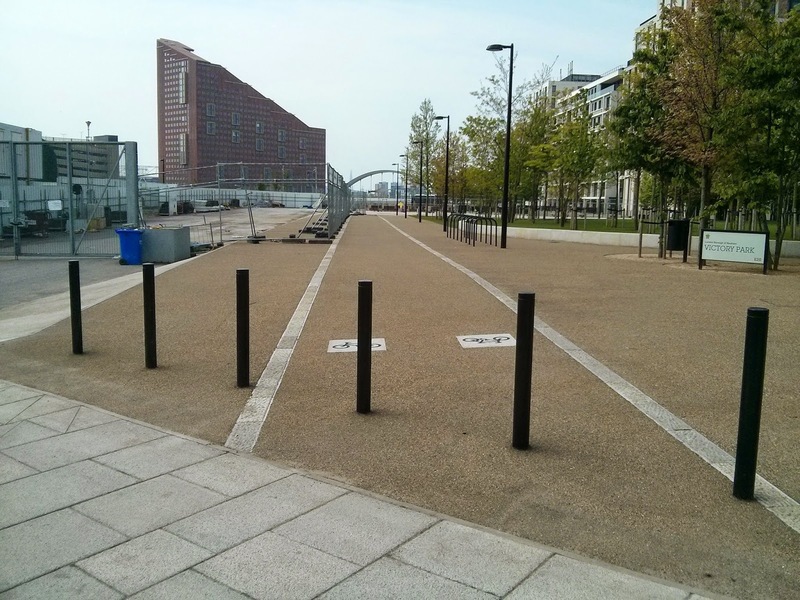 This month the rest of the Park has finally reopened nearly two years after the games and I thought it would only be right to visit it and see if they had built some better quality cycling infrastructure this year than the stuff they built last year. 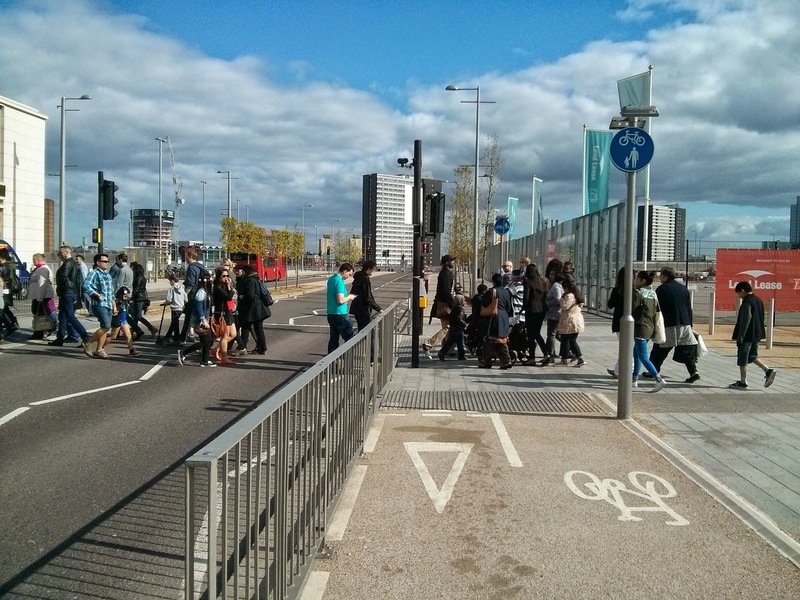 The cycle track gives way to both people who are already crossing from the main entrance of the Olympic Park to get to Westfield and Stratford station and also gives way for people who are waiting to cross. Meaning you have to give way about 99% of the time. 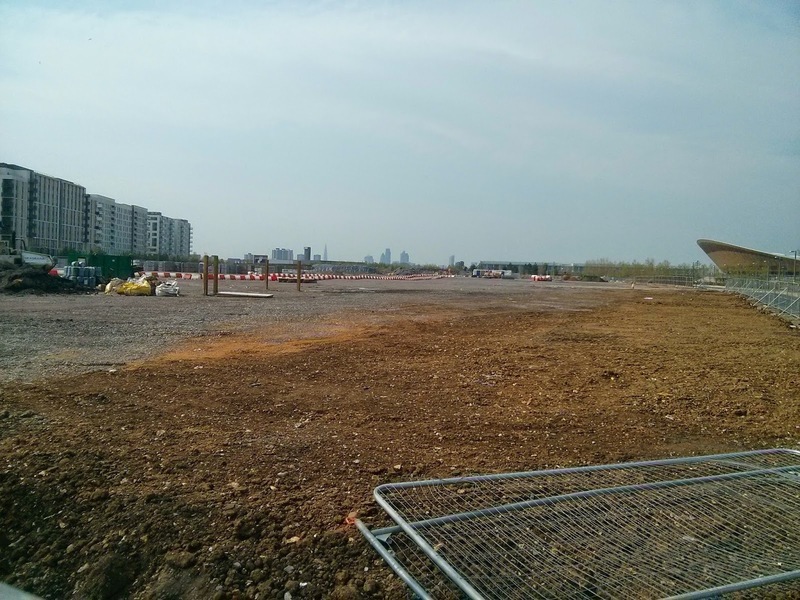 The vast empty concrete area to the right of here is where the army searched people in the summer of 2012. 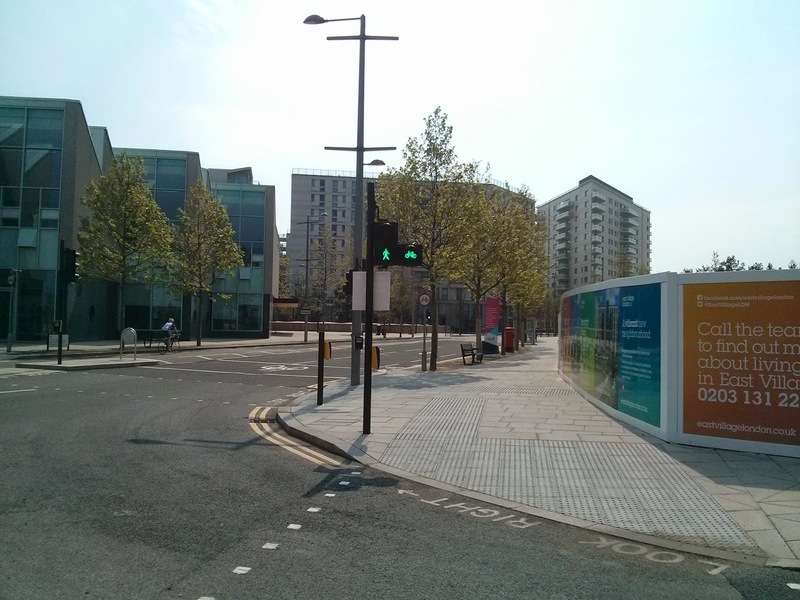 It will eventually be the International Quarter; a "new metropolitan business district for London" meaning this cycle path will be totally unusable in a few years time when you have to give way to the 25,000 people expected to be working in those skyscrapers. 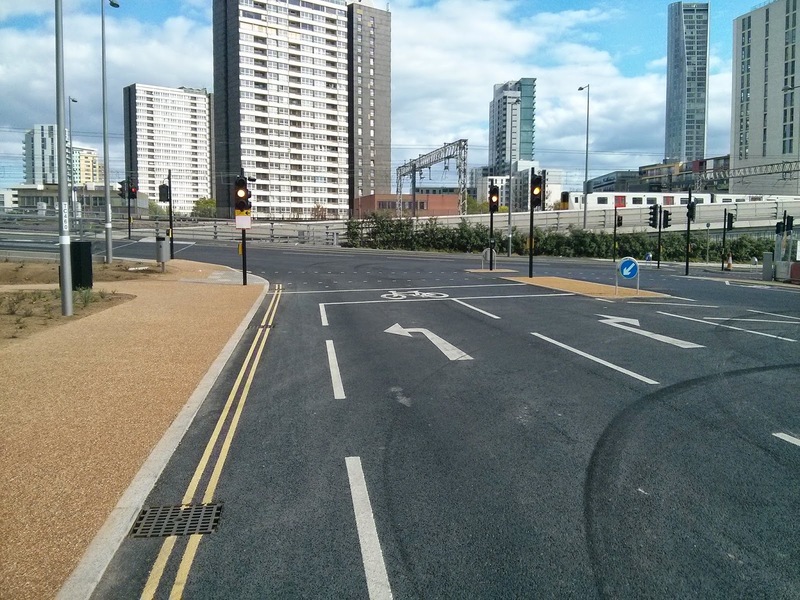 Or the 54,000 football fans that will also need to cross here. Or the many thousands of people just coming to the park itself. 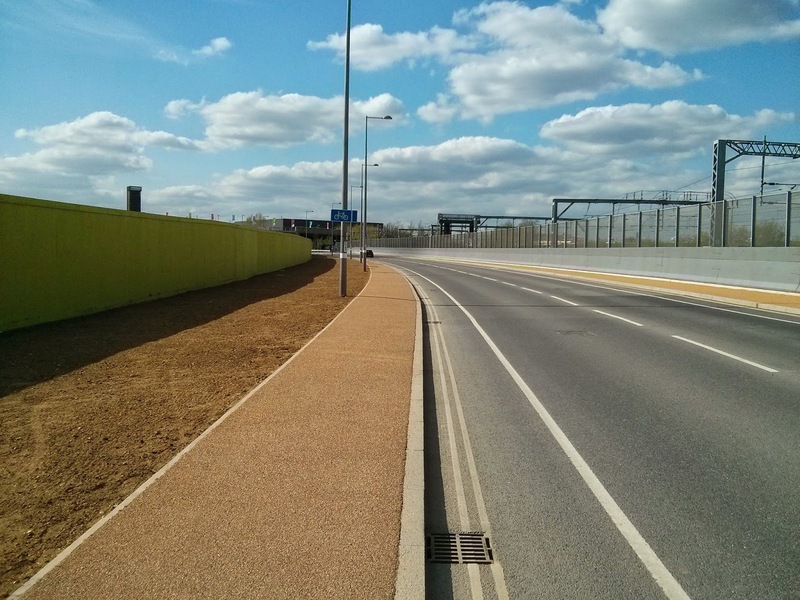 Meanwhile the road to the left of the cycle track is a large dual carriageway with a vast central reservation; an obscene waste of space that could have been used for cycle tracks on either side of the road that are separated from both the pavement and the road. 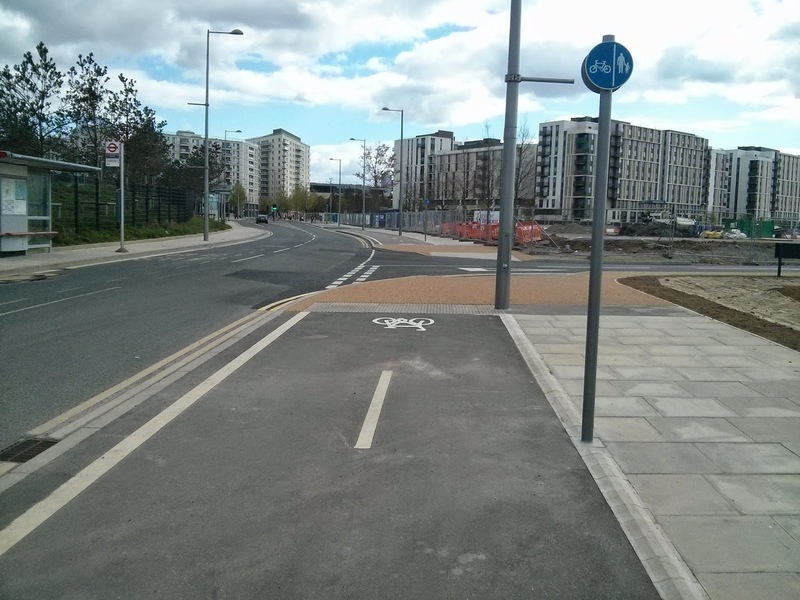 If you continue along the cycle track it suddenly stops dead, if you want to turn right onto Montfichet Road then the cycle lane continues on the pavement on the opposite side of that large concrete wall on the other side of the road. 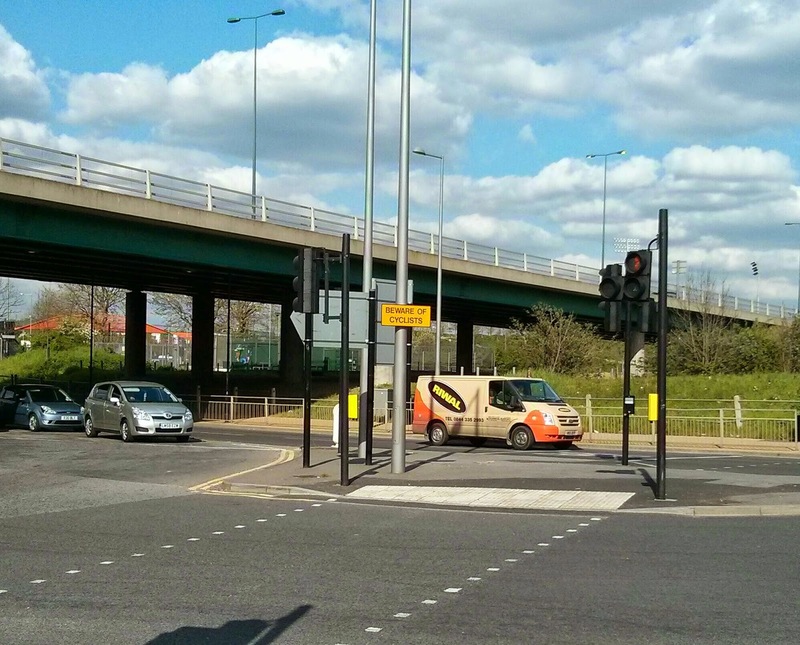 To access it you have to use four pedestrian crossings. 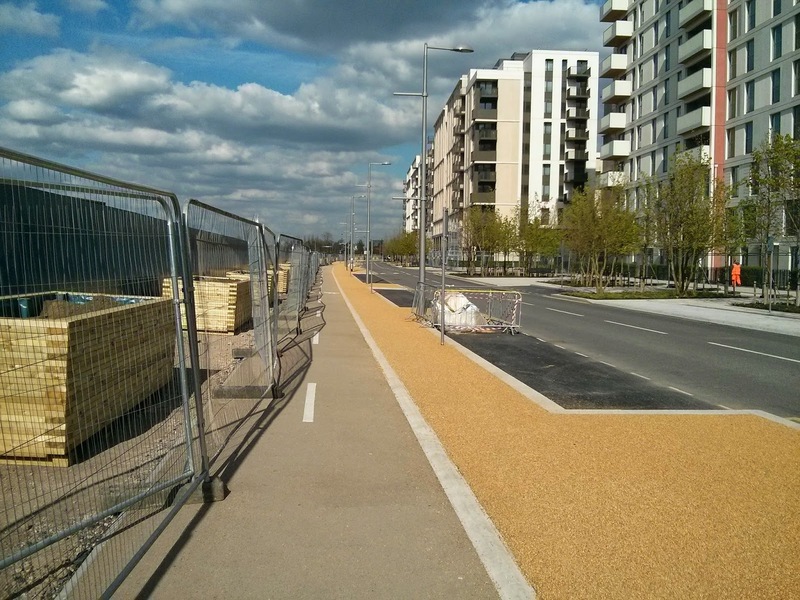 Remember this road did not exist at all a few years ago, it was just a building site and wasn't built until shortly before the Olympics. 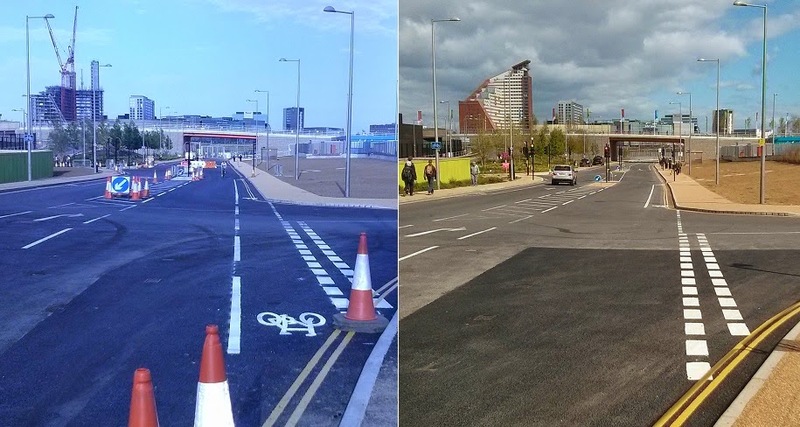 I remember cycling on the Greenway back in 2010 watching them build the flyover that this road would become and wondering if t would be a temporary road just for the Olympics or part of "the legacy". 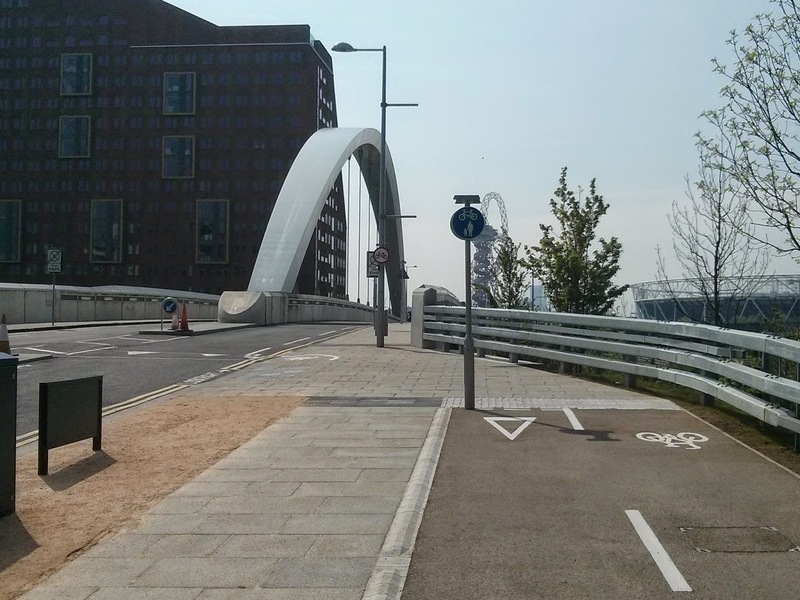 They had the money, time and space to design it well and they totally messed it up with seemingly no thought or proper planning going into the cycle infrastructure whatsoever. 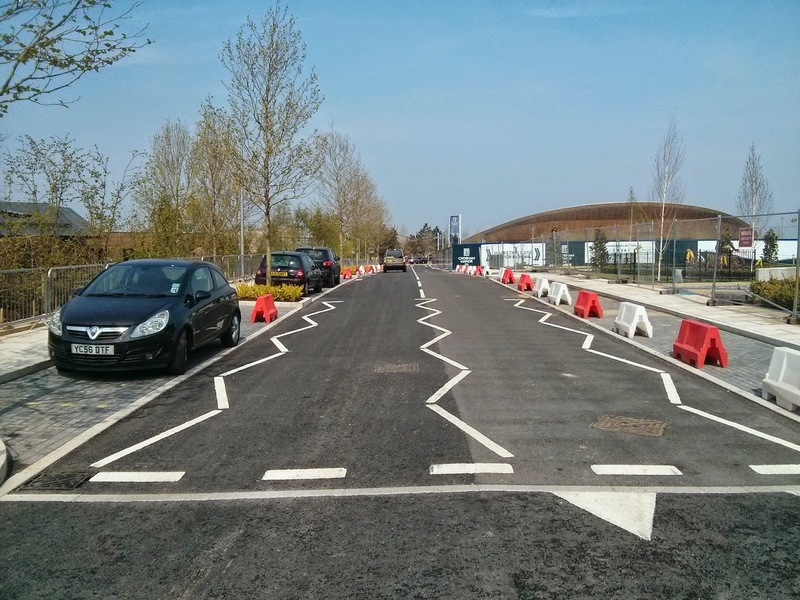 Could you see your 8 year old daughter or 70 year old grandmother cycling out of this brand new road leading from the car park, constructed within the past few months? 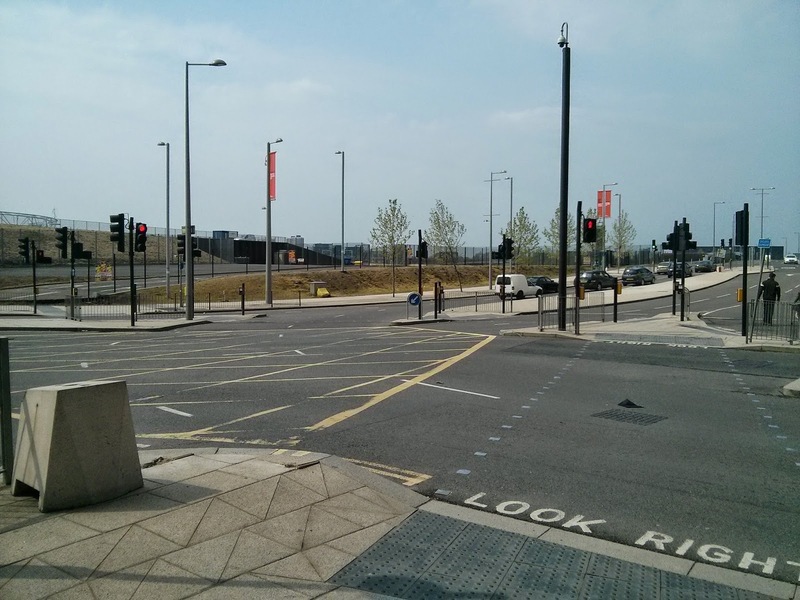 In fact if you go on Google street view you can see how it looked back in 2012, just months before the games, and the amount of space they had here. 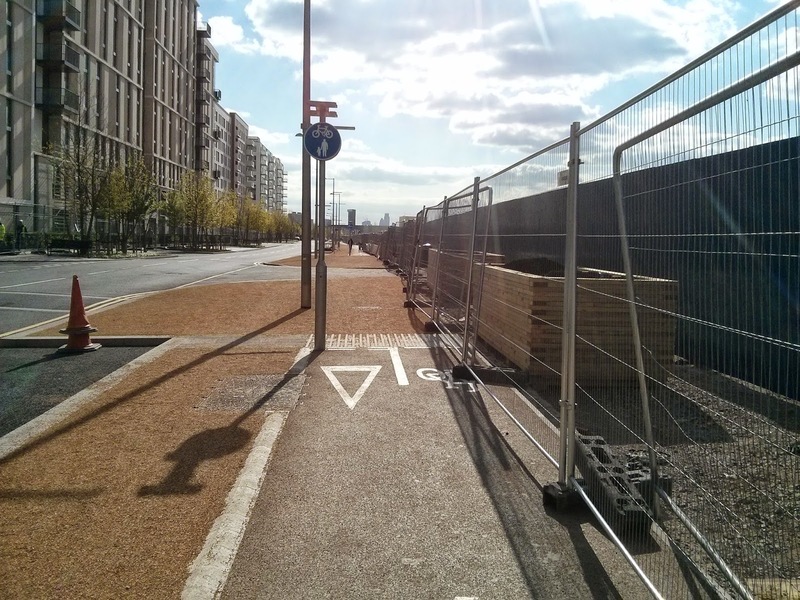 it's not perfect; the pavement on the other side of the road is quite narrow yet has shared space signs for cycles, the zebra crossings don't link up with the paths leading from the park towards Wallis Road in Hackney Wick and lorries can park on the track. 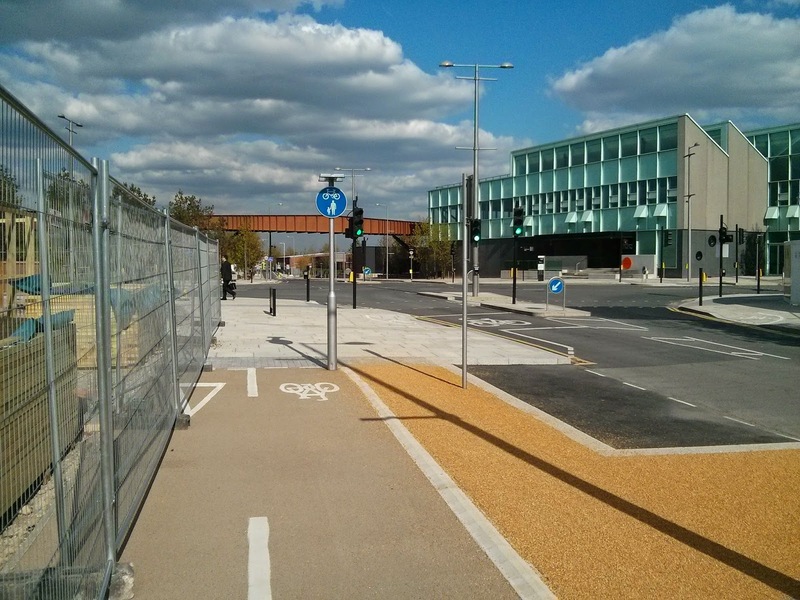 However this part of the Olympic park that is located in Hackney has some of the best cycle and pedestrian infrastructure to be found here. 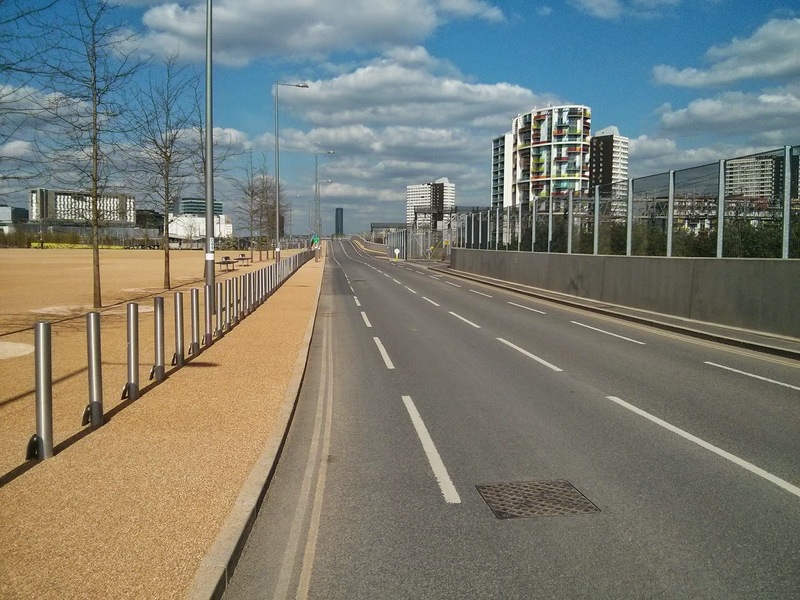 And then you get to the Eastway, which used to be two way for bikes and one way for cars but now to allow bus route 388 to transport not many passengers from Hackney Wick to Westfield they've recently opened it up eastbound to "bikes, taxi's and buses"
and then another for vehicles turning left to "Beware of cyclists"
Again they've made the pavements and crossings shared use but kept ASL's on the road catering to two types of people cycling. 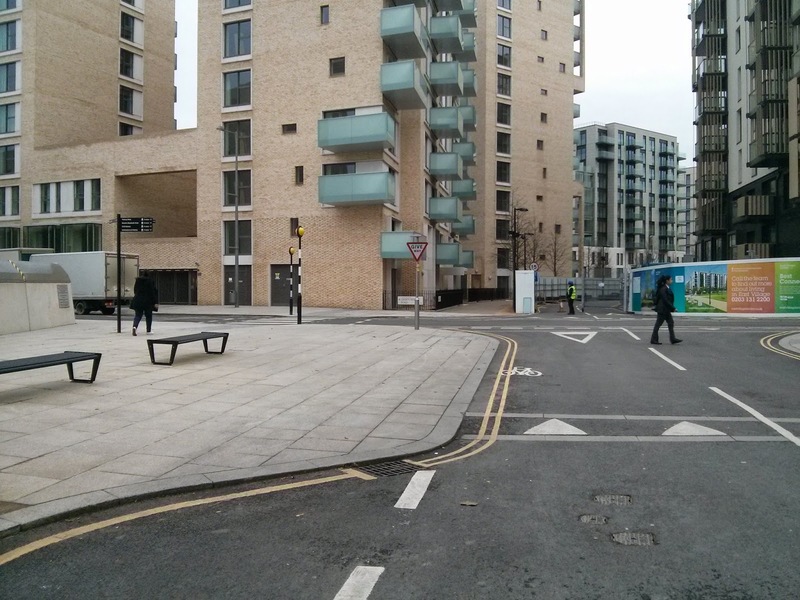 The junction here is massive and there is plenty of space to "go Dutch". 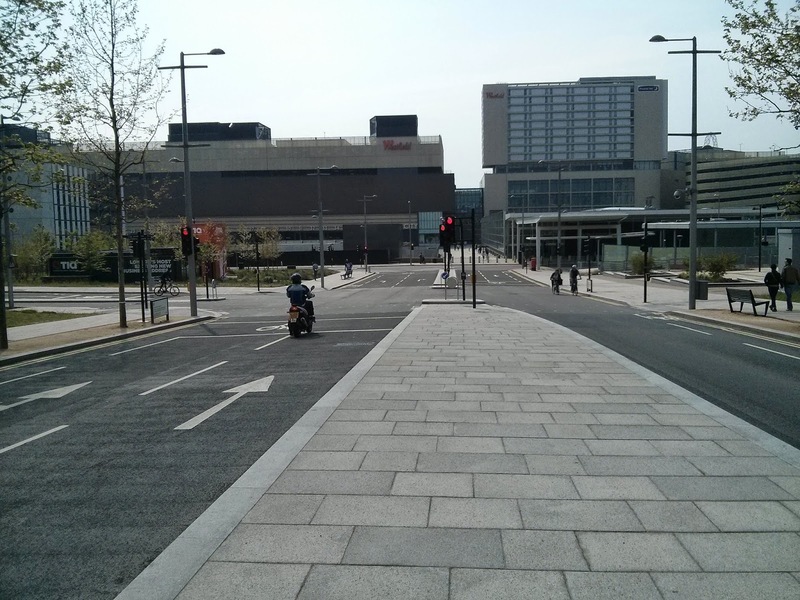 It also has wide pavements (shared use, of course) despite the fact that I suspect you will hardly ever see anyone walking along this road as there is nothing on it at all and there seemingly never will be. 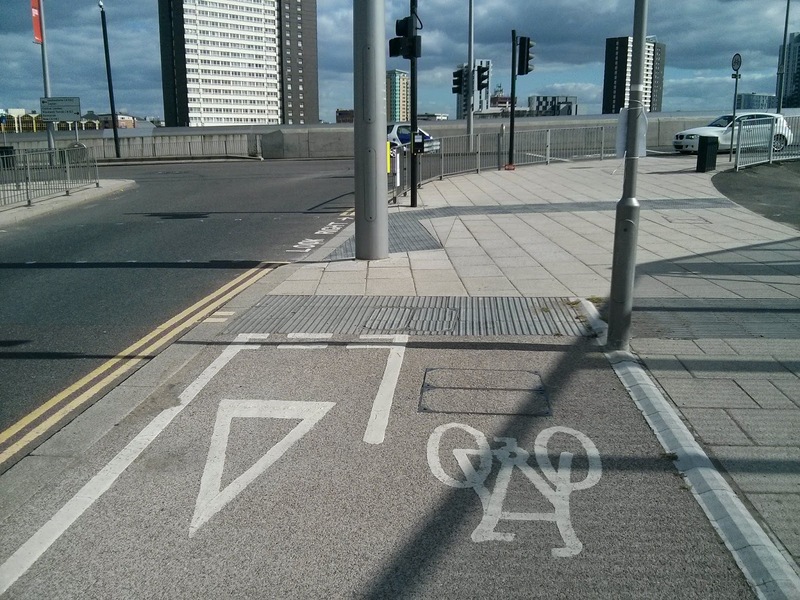 The cycle lanes also just ends as you approach the junction, without so much as an ASL to help you out. 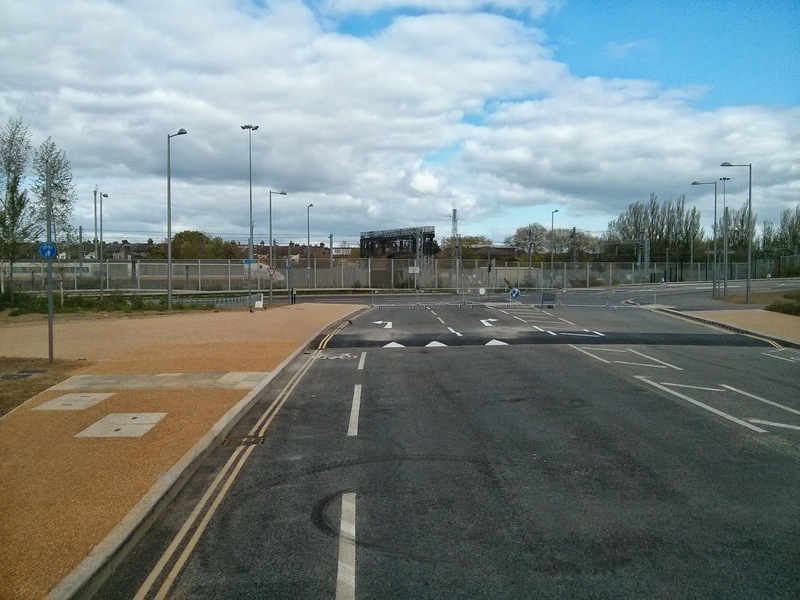 Note the large area to the left here, perfect size for a wide two way cycle track that would by-pass the bus stop, however the planners have just put some mud here instead. 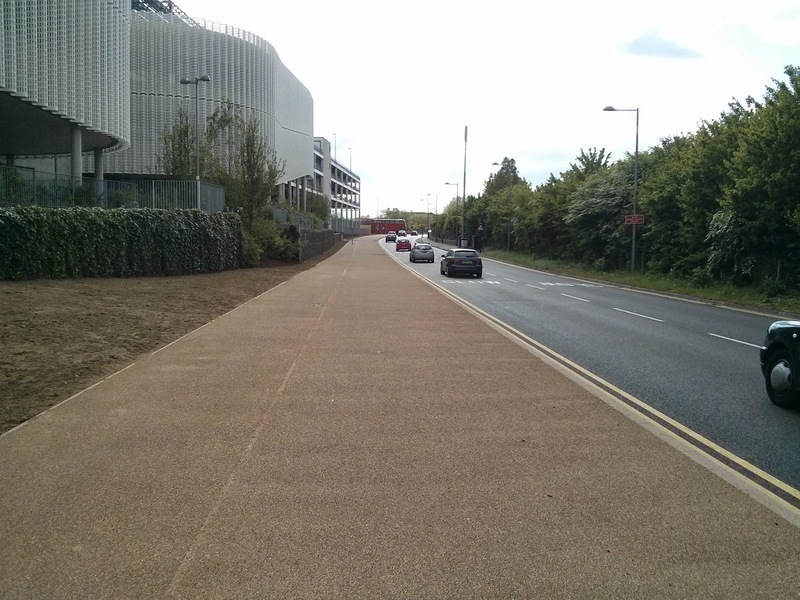 The cycle track does then continue for a short section until both cyclists and pedestrians have to give way to cars travelling to the velodrome car park. Thanks to Google earths historical aerial photography feature I know that in the photo above I'm stood in the exact spot of the southern loop of the Eastway cycle circuit. 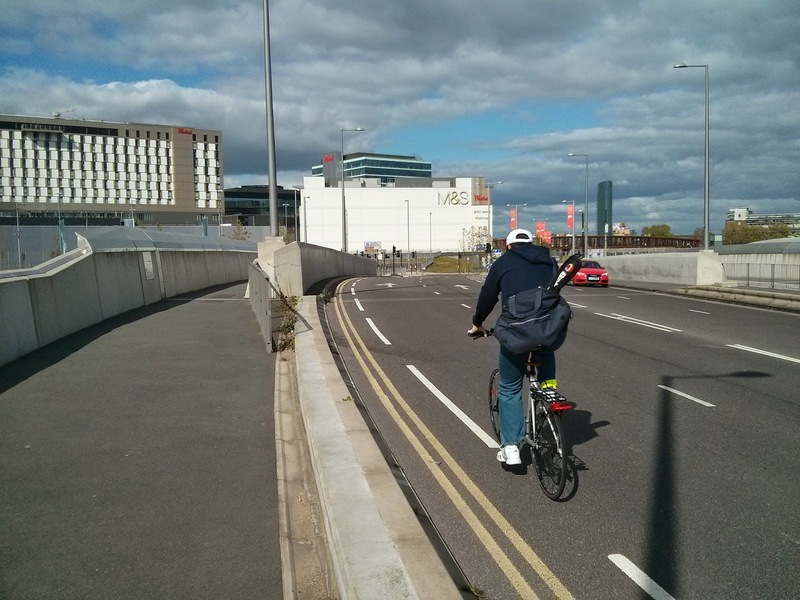 Less than ten years ago this entire area was devoted solely to bikes. 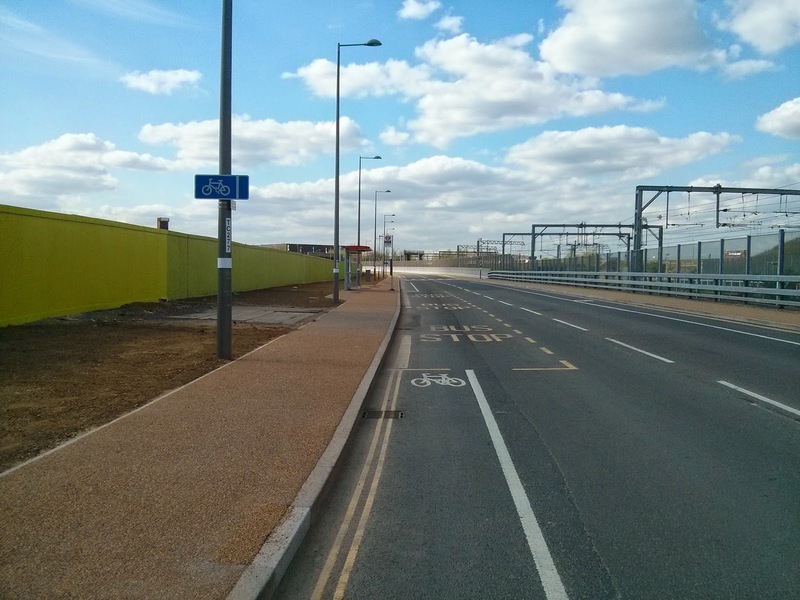 The road then does then have a two way cycle path on the pavement again from here down to the bridge over Stratford international station but again no clear way to access it and if you didn't already know it was there you would have cycled past on the road without seeing it. 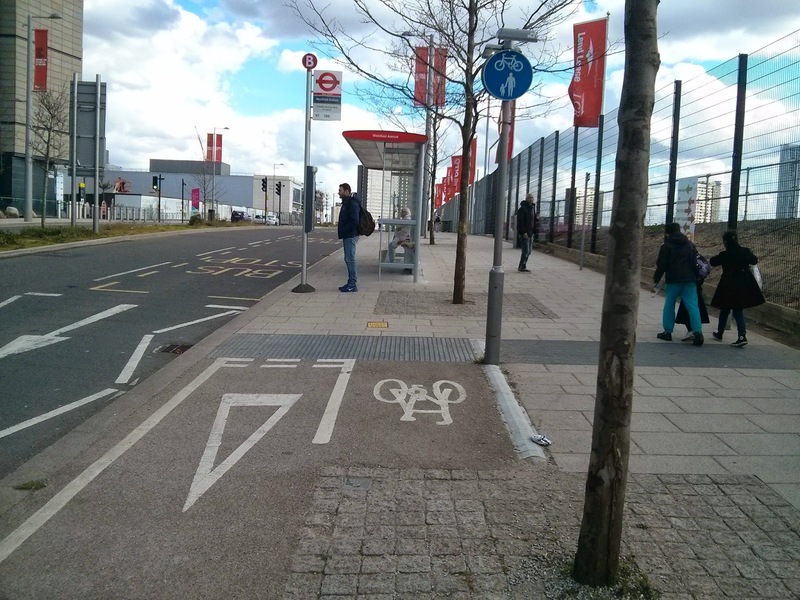 That cycle track then just stops a bit further down the road, forcing you to cross the road to continue over the bridge over Stratford International station. 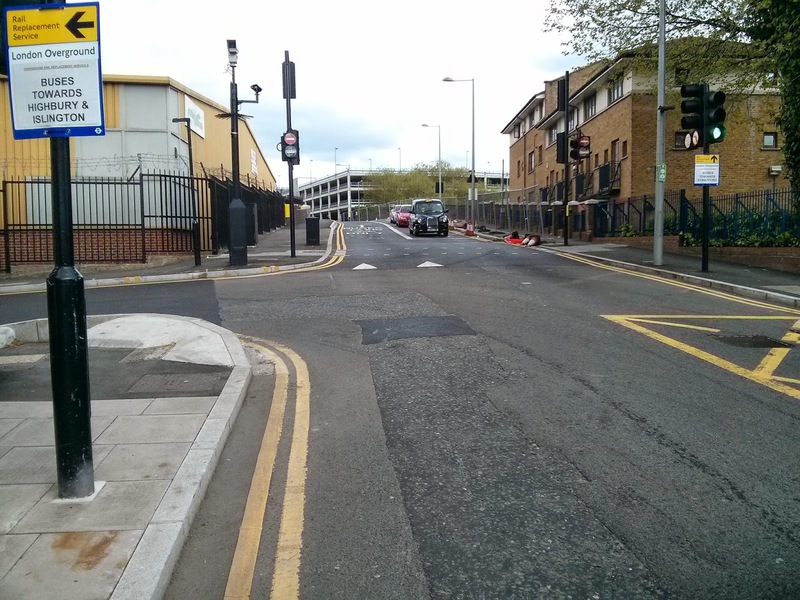 They obviously expect people to use the road as it has two tier provision again at this junction, shared use pavements and crossings alongside an ASL on the road. 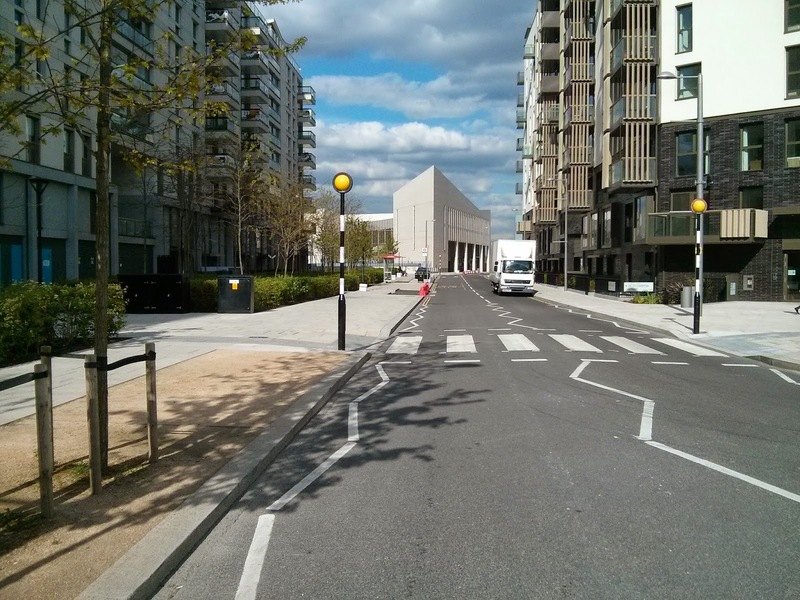 We then come to the new school in the park, which opened late last year. I was in the area a couple of months back and happened to be passing shortly after after three when it was time for the school run. 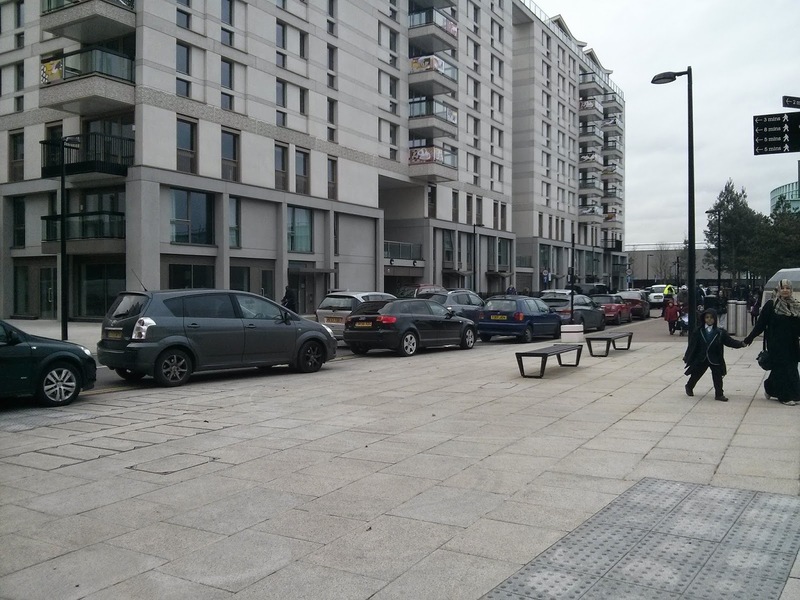 Despite this being just a short walk away from one of the best connected railway stations in the country the cars were parked up outside three rows deep; on the pavement, on the double yellow lines and also slap bang in the middle of the road. I'm sure inside the school they are trying their best to teach the kids right from wrong but outside their parents show total disregard for the law and selfishly block the entire road to everyone. In the Netherlands the vast majority of children cycle to school whereas here in the UK the figure is between 1% and 2%. 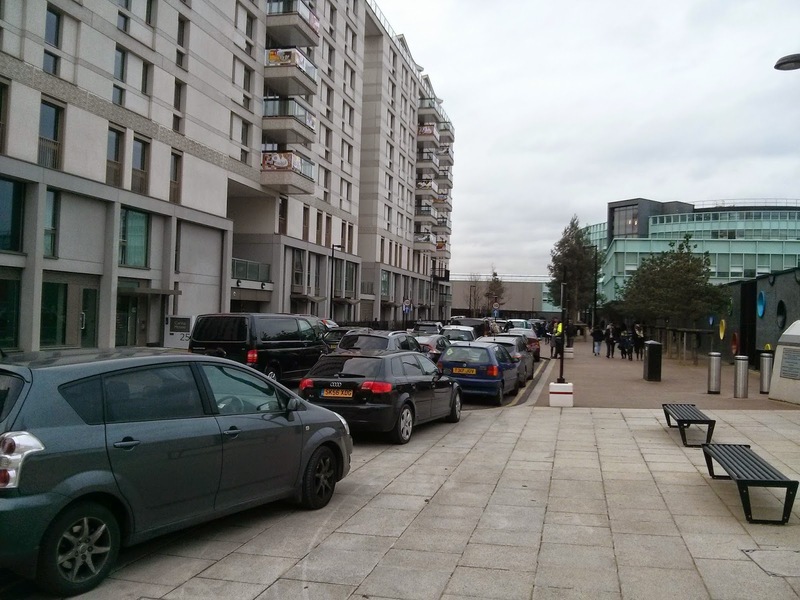 In Newham, the borough where this school resides, 30% of all trips are made by car and just 1% of all trips are made by bicycle, the lowest figure within inner London, even though 58% of households in Newham do not own a car. That link also explains that Newham’s obesity rate among primary school children (year 6) is 26 per cent, higher than both the national and London rates. Not sure whether the school even provides cycle stands for the pupils or not but there is definitely none outside and searching for cycling on their website returns no results. 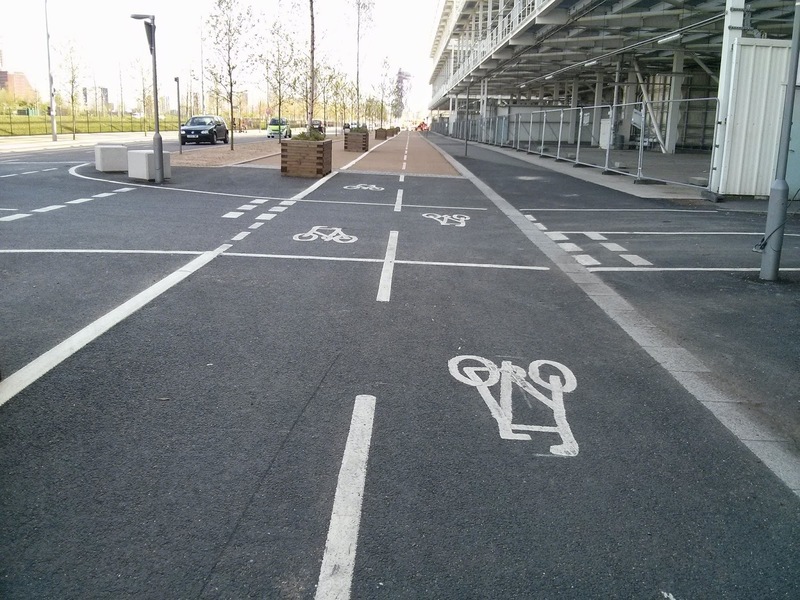 Newham councils travel to schools plan certainly does not fill me with confidence. 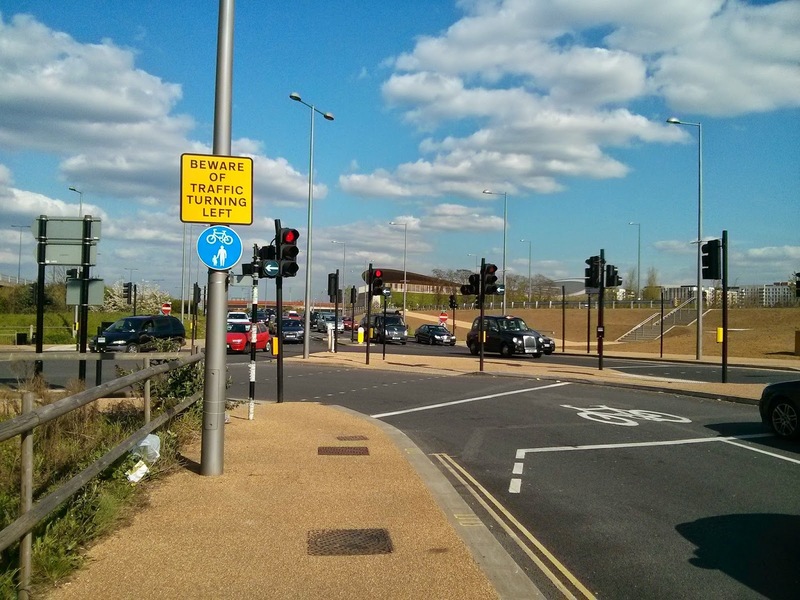 Nor does it to see schools offer children cycle training and then point out to parents that despite the training they don't encourage children to cycle to school due to heavy traffic. It's no surprise then that the Netherlands ranks top in the world in the child well-being table whist the UK is 16th. 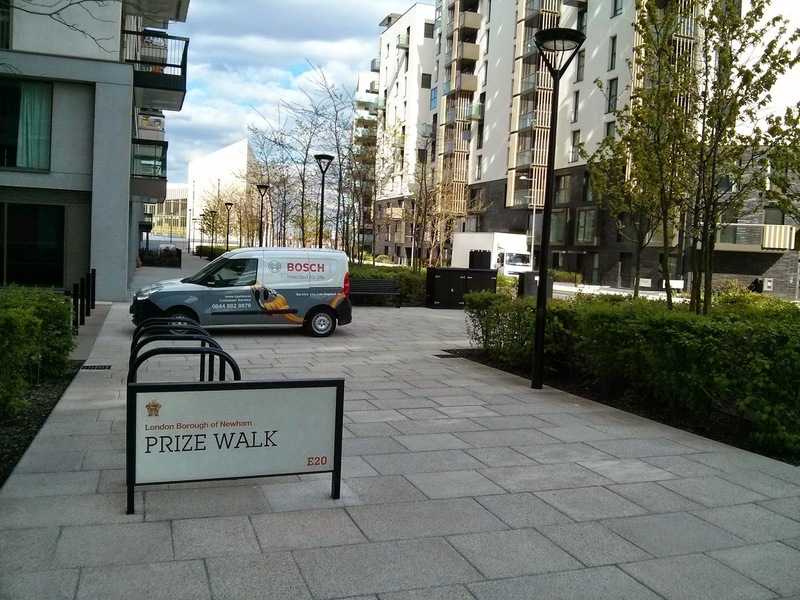 Underground car parking does exist in every block within the East village, although there is a weekly charge along with a waiting list. The owners admit that demand will exceed supply and there is likely to be a long wait for available spaces. 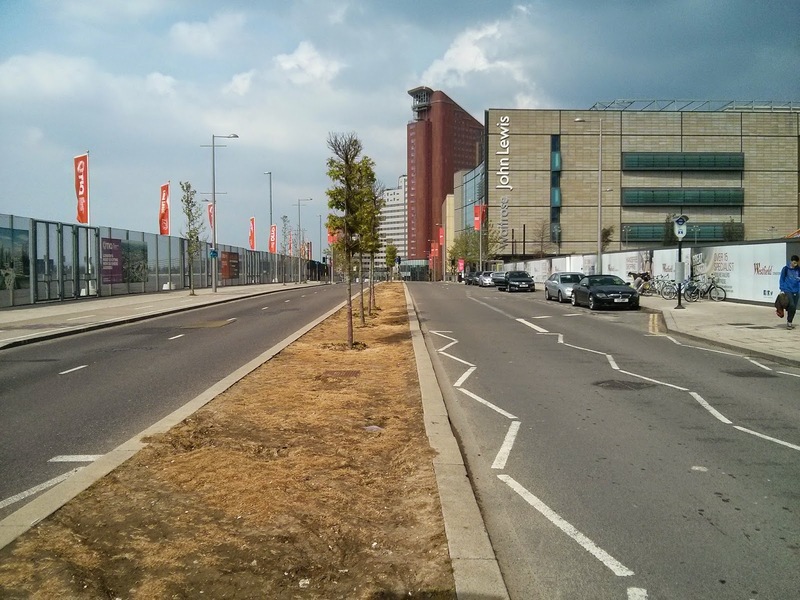 Compare this to the new development of Kloostereen in the Netherlands, which will eventually have 9000 homes. Every single home has more than adequate car parking so there will be no neighborhood disputes and no Parking mad TV programme to be made there. 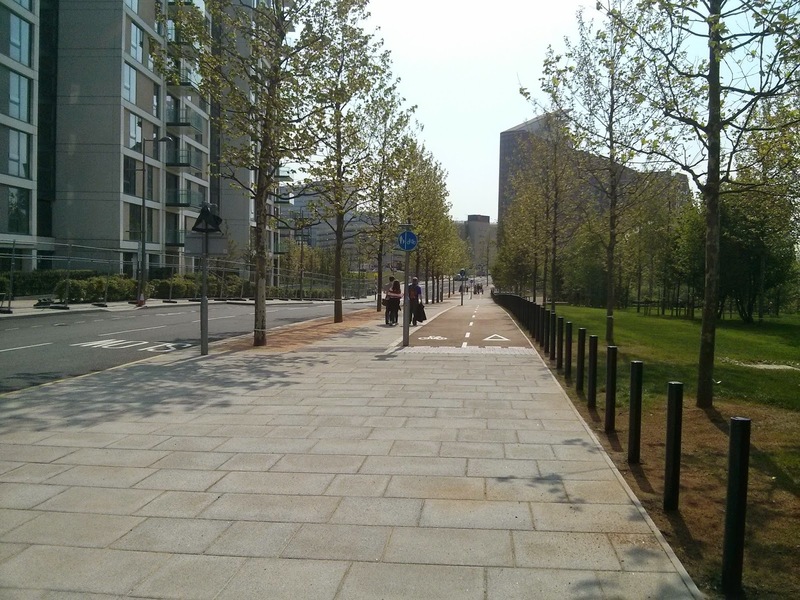 They still expect 86 cycle trips to be made per day per 100 residents in Kloostereen though as cycling was designed into the development from the beginning. 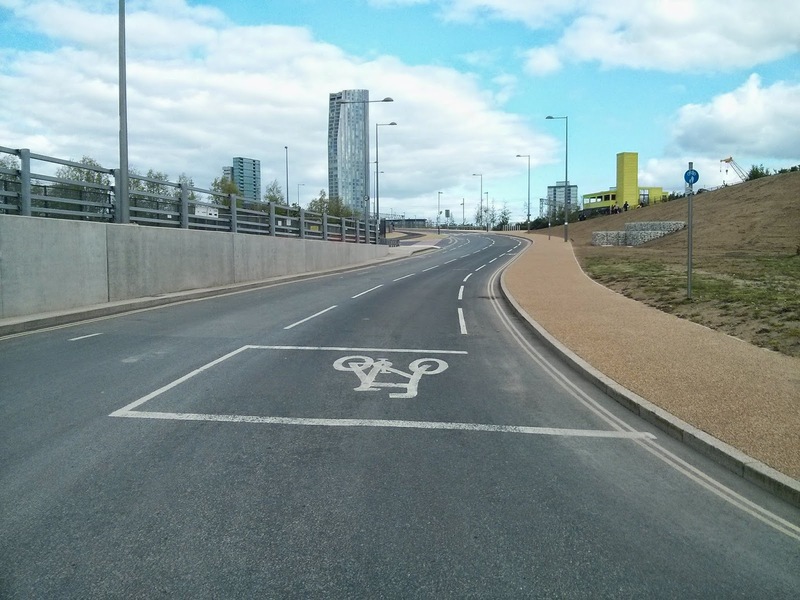 Important to note that if you make driving or parking harder it doesn't necessarily mean more people will cycle but if you concentrate on building decent cycling infrastructure that is appealing and safe for all then you will see more people cycling. 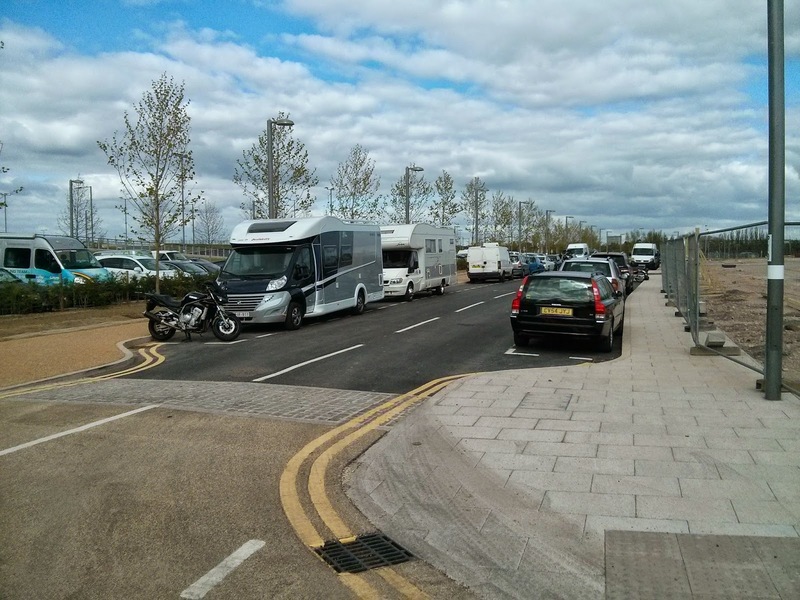 So whilst the artists impressions of the park always seem to show people cycling and walking, and the promotional videos talk of cycle spaces for every home and of how well connected the area is by public transport the reality is a park is designed and catered for motorists. 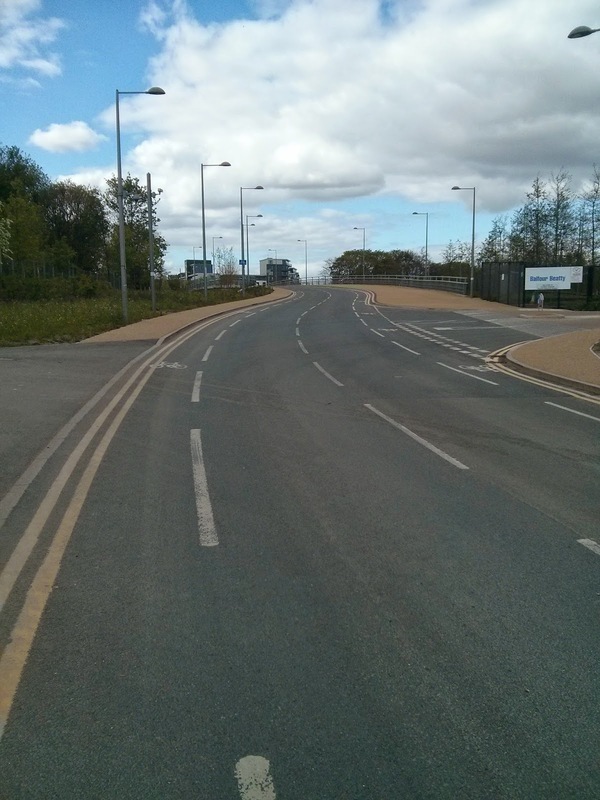 Huge wide roads with absolutely no restrictions on them for any vehicles. 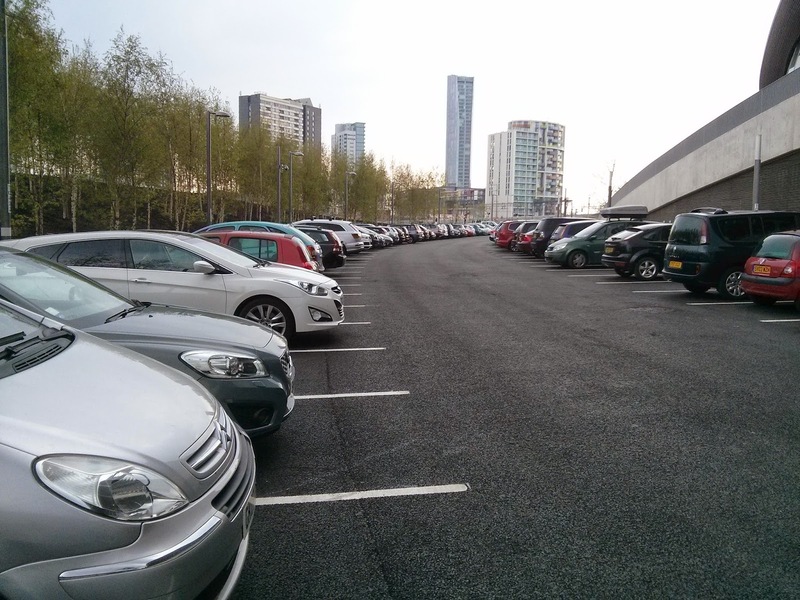 Enough parking for thousands and thousands of cars. 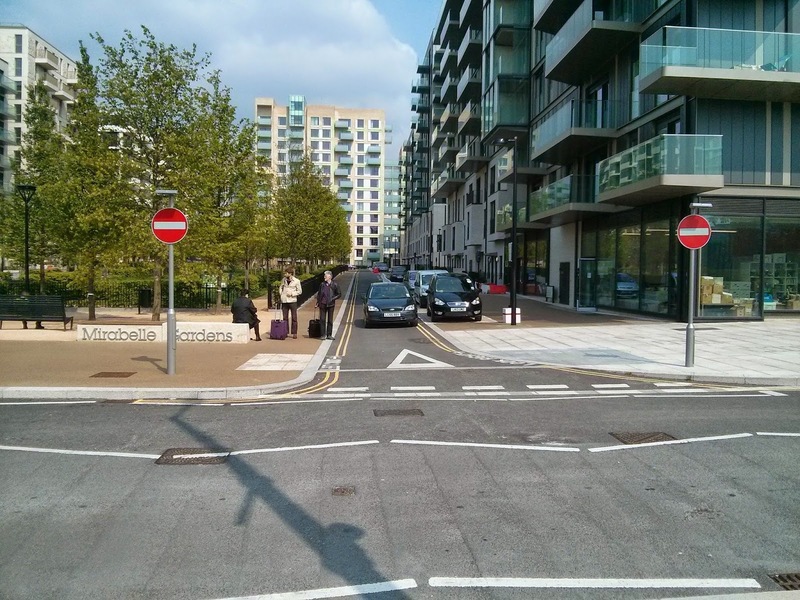 Pedestrian crossings that take ages to wait for the green man and where in places you need to wait in multiple pedestrian pens just to cross from one side of the road to the other. 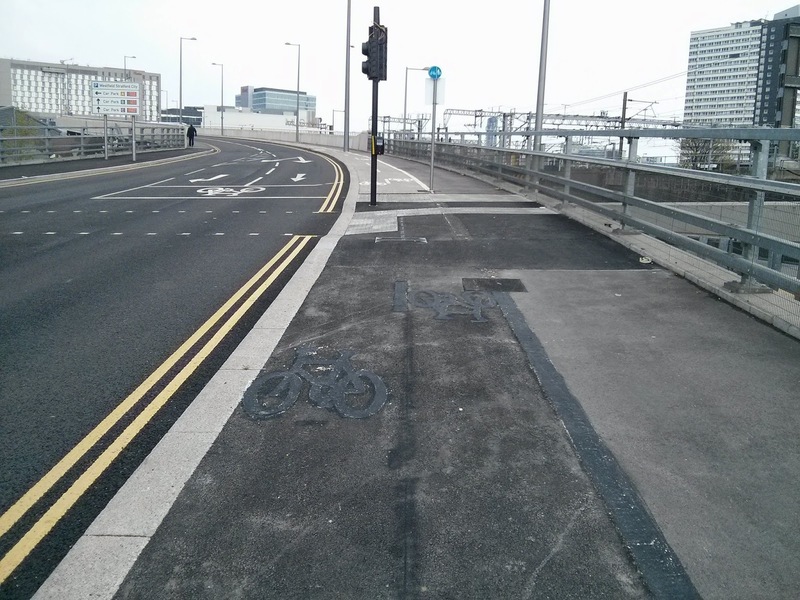 Crap cycle lanes that are designed so badly they are in places totally unusable. 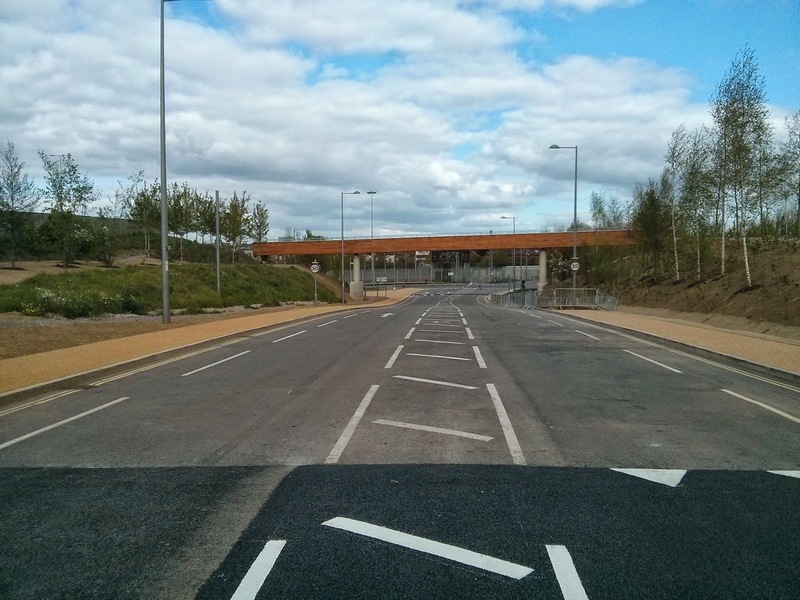 Every part of the road network within the park has been designed about accommodating motorists as best as possible with any pedestrian or cycling infrastructure seemingly a mere afterthought. 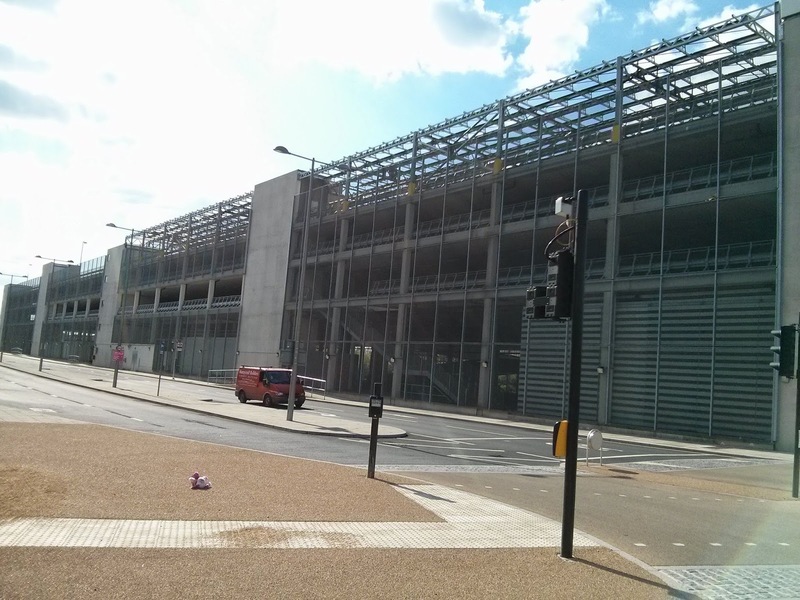 Nearly ten billion pounds was used to build the Olympic park which could and should have been designed around people, not cars. It could have been very different but is instead a once in a generation opportunity well and truly missed.